Tucson has outdone itself with regards to its museums and cultural offerings. 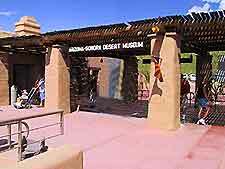 The Arizona-Sonora Desert Museum is superb and boasts botanical gardens and a zoo, including plants and animals indigenous to the Sonoran Desert. Tucson's Titan Missile Museum offers a close-up glimpse of a nuclear missile and what life must have been like for the men working in the silo, while the Children's Museum has plenty of fun, family friendly hands-on exhibits. 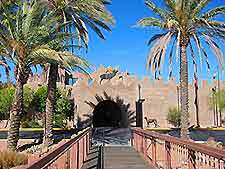 Also encompassing Tucson's Reid Park Zoo, the Arizona Sonora Desert Museum is devoted to the Sonora Desert and features a zoo and botanical gardens. The zoo is very well designed, with the animals retaining their respective environments. Creatures here include cactus wrens, hummingbirds, rattlesnakes, scorpions, prairie dogs and bighorn sheep. 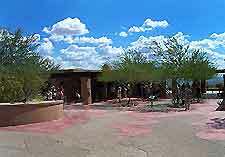 Among the uniquely-designed environments are the javelina and coyote exhibits, with their invisible fencing, and the Riparian Corridor section, where you can see otters and beavers in their natural habitats. With its artificial limestone cave, The Earth Sciences Center and its excellent gift shop are also worth a look. 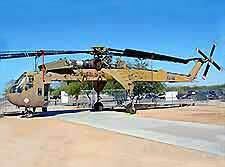 The Pima Air and Space Museum is the biggest of its kind in western USA and features an impressive collection of more than 250 aircraft, together with a host of memorabilia. Highlights include tram rides, a Morphis Simulator, the Air Force One plane once used by US president JF Kennedy, a popular visitors' center, a gift shop and the Thunderbirds Grill restaurant. Featuring statues of two of Arizona's most important sons, Father Kino the Jesuit and John Greenaway of copper-mining company Phelps Dodge fame, the Arizona Historical Society's Museum has exhibits on the region of southwestern United States and northern Mexico. Attractions include the 'Life on the Edge: A History of Medicine in Arizona' exhibition, one of the highlights, while the library has a fascinating collection of old Arizona photographs. The copper mining exhibit will appeal to kids. Often known as the Tucson Natural History Museum, the International Wildlife Museum features exhibits of hundreds of insects, mammals and birds from all over the world. With dioramas, temporary exhibits, interactive displays, a wildlife theater, guided tours, educational information and research facilities, this important attraction was founded in 1988 and stands in the Tucson Mountains. An excellent educational tool for the kids, the Children's Museum resides within downtown Tucson, at the old Carnegie Library, and has plenty of interactive exhibits for little ones. Exhibits change every year and past attractions have included a bubble factory, a fire station and a doctor's office, while dinosaur sculptures are a permanent fixture. The best time to come here is on the weekend, when special performances are staged. The Arizona State Museum celebrates the culture and life in the Arizona and north Mexico area and features a range of exhibitions. 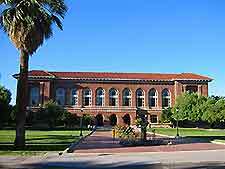 Dating back to 1893, this is one of America's largest anthropology museums and is an important research center in the University of Arizona complex. 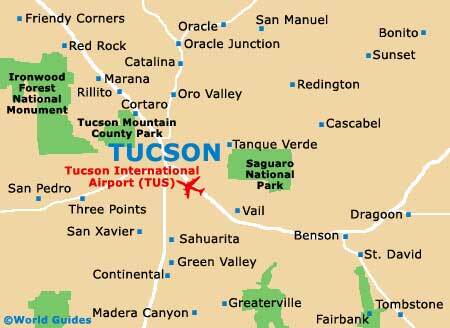 Located just outside Tucson, the Titan Missile features a deactivated intercontinental ballistic missile, or ICBM, and its associated silo. Visitors can descend into the silo and marvel at the sheer size of the missile - minus the warhead of course. The museum is operated by the Pima Air and Space Museum and guided tours explain what life was like for the missile operators and the ins and outs of the missile system.